If you are considering a new pool or even replacing your existing pool pump, you're probably wondering which type pool pump will best meet your needs. There is the single speed and two-speed pumps, which are the old standbys. Then there is the modern marvel Variable Speed Pool Pumps. Which was first introduced by Pentair. 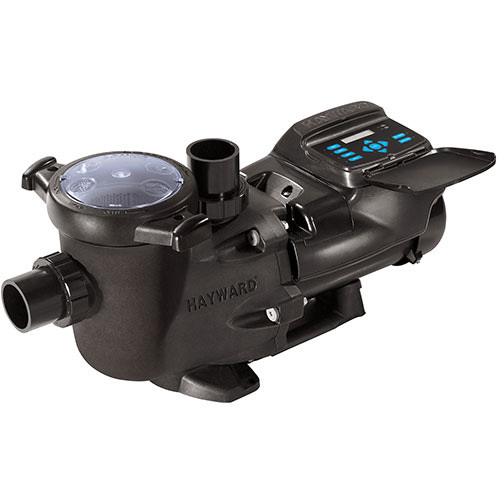 They were the first manufacturer to introduce variable speed technology to the pool industry. Variable speed pool pumps are one of the more gratifying pool equipment innovations out there today. They can be programmed to run at precise speeds for numerous pool operations such as filtering, heating, cleaning, jets, water features and more. Plus provide the added bonus of reduced energy costs. Variable speed pumps might be the only option for some of us as many states are mandating variable speed pumps with new or replacement pumps. So it might not be your decision, the state you are living in will decide for you. Just as it is for pool owners in Arizona. Variable speed pool pumps work entirely different even though they look just like your normal pool pump. However unlike the induction motor used in single and two-speed pumps, variable speed pool pumps utilize a permanent magnet motor. This allows the operator to enter in the exact flow rate they need for their pool. The notion is that reducing the flow rate of water creates less friction, which makes the entire system run more efficiently. Due to this they run quieter and cooler, vibrate less, have digital controls, and have innovative diagnostics. 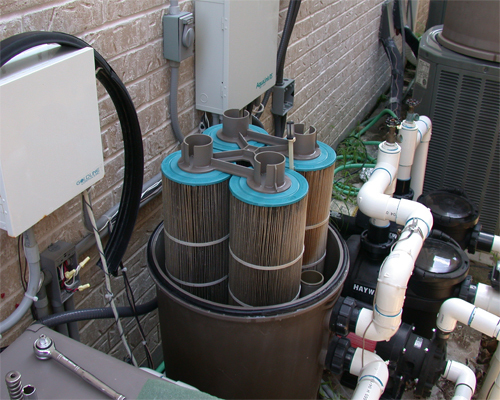 Pool pumps are the heart of any pool’s circulation system. Your primary pump keeps water moving through your filters, heaters, skimmers, and water features. Then there is the accessory pump which is used to run cleaners, draining, and to operate other additional water features. The best investment you can make for your pool is a high-efficiency Variable Speed Pool Pump. You can save significantly on utility costs and be more environmentally friendly. Most studies show that they are 90% more efficient than standard one-speed pumps. On average, this can equate to an operating cost of approximately $20-$30 per month. If you have any questions about Variable Speed Pool Pumps give us a call at 623-939-1346 or come visit us at our retail store and one of our pool care professionals will be happy to help! Are you looking to lengthen your swimming season? Then you will want to consider a Pool Heater. They are a great way to quickly heat your water, and allow you to enjoy your pool after the end of normal swim season. Ideal for in-ground pools, heaters are designed to extend the season into the early spring and late fall by keeping your water at a comfortable swimming temperature. A Heat Pump is an efficient and useful way to heat your pool. Purchasing a Heat Pump will give you warm water even during cold weather at low operating costs. Heat Pumps work by gathering warm air around the pool, compressing and heating it, and using that hot air to heat the pool water that runs through. Heat Pumps are designed to raise the temperature of a pool up to the perfect swimming range, between 78 – 82 degrees Fahrenheit. But because they work by taking in air that is already warm, they work best in humid areas where the temperature stays above 60 degrees Fahrenheit. Most Heat Pumps will still operate if the temperature goes below 60, but will automatically shut off if the temperature reaches 50 degrees or below to prevent damage. Heat Pumps usually offer ranges from 50K BTUs for smaller pools, up to 135K BTUs for larger pools. Heat Pumps are cheap to run, easy to use, and need minimal maintenance. They are cost-effective and environmentally friendly because they do not use fossil fuels to heat the water. 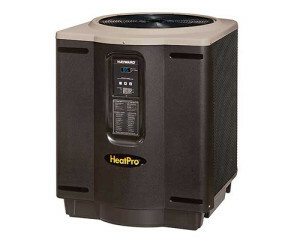 Gas Heaters run on either propane or natural gas, depending on the model, and run at up to 80-95% energy efficiency. Gas Heaters are some of the most effective heaters on the market. They are designed to raise the temperature of a pool up to the perfect range, between 78 – 82 degrees Fahrenheit. Most Gas Heaters are capable of increasing the water temperature 30 degrees or more. Gas Heaters usually range from 125K BTUs for small pools, up to 400K BTUs for large pools. Most Gas Heaters meet or exceed Low NOx Emissions Requirements, meaning you are getting the most advanced, eco-friendly heaters available that will keep your pool and your family safe and healthy. For those who want to go the extra mile, without retaining the heat in your pool much of the energy that is used warming the pool will dissipate into the air. Using a solar cover along with a heater can save you as much as 50% of the cost of energy it takes to heat your pool. Combining a solar cover with a Heat Pump will heat your pool more quickly, and will keep the pool warm long into the night. Pools come in all shapes and sizes, so the heat needed for each pool can vary to reach comfortable temperatures. If you are not sure what size pool heater you should be looking for, a Pool Supply Warehouse professional is available at our retail store or at 623-939-1346 for any questions you have. We know that pool maintenance isn’t the most exciting part of owning a swimming pool, but hopefully this guide will be helpful for you DIY’s. There is some good news, one advantage of having a cartridge filter is the lack of required continuous maintenance. Unlike a sand filter that needs to be backwashed multiple times per month, a cartridge filter only needs to be cleaned a few times per year. Generally, if you clean your filter at least every quarter, the life of the cartridge elements will be extended. When a cartridge filter needs to be cleaned, it can be somewhat of a lengthy and tedious process. But it is essential that you clean your filter element properly. The steps are simple and will show you how to effectively clean your cartridge filter. When working with any pool equipment, be sure to shut the system off first. There is a clamp or clamp-like fitting that holds your filter together. Loosen and remove this clamp. Now different brand filters may have different riggings, so if you run into any issues you can snap a photo of your system and show it to a Pool Supply Warehouse professional at our retail store. After you have removed the clamp, you can take off the top section of your filter to bare the internal cartridge elements. Depending on your brand and model, there might be something holding your cartridges together or in place. This will need to be removed as well before you can take the cartridge elements out. At this point, you should be able to remove the cartridge elements. Give each cartridge a good look to check for any damage. If you find any cracks in the housing or tears in the pleats, we strongly recommend replacing the cartridge. You can use a degreaser or similar cleaning products and coat the cartridge elements. Make sure you are getting in between the pleats of the filter element as this is where most dirt and debris is found. Usually you will need to let the degreaser sit for a short period of time to loosen up any debris. Then simply rinse it off. It is important to thoroughly clean in between the pleats. You can use your garden hose and place a finger partially over the end to increase water pressure. There are also accessories that are made to rinse in between the pleats on the cartridge element that can attach to a garden hose. When your cartridge elements are clean, simply put all the parts back in their appropriate places. There is an O-ring on the filter tank that you need to check if it’s in good condition. If it appears dry-rotted or flattened it is recommended to replace it. If not, apply a bead of silicone-based lubricant over the O-ring. Put the tank lid back on and secure the clamp or clamp-like fitting that holds your filter together. Now time to run a system test. You should take a second look to make sure everything was replaced correctly and there are no leaks. While running, open the air relief valve at the top of your filter to discharge any extra air. Keep the valve open until only water sprays out of the valve. Once completed take a look at the filter pressure gauge on top of the filter to make sure the PSI is within your systems recommended ranges. Different brands may have different ranges, so if you are unsure what your systems range is, give us a call and a Pool Supply Warehouse professional can assist. If the PSI does not return within its normal ranges, turn the system off and make sure all parts have been replaced correctly. Then run another system test. If the PSI is still off, contact us and a Pool Supply Warehouse professional can help out. At any point during this process you have questions or you would rather have an expert come out and service the filter for you, a Pool Supply Warehouse professional is available at our retail store or at 623-939-1346 for any questions. 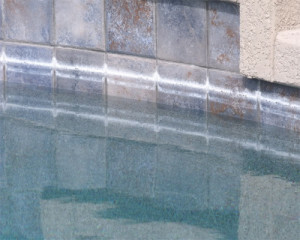 Pool Stain and Scale can really affect the health and look of your swimming pool, especially the tile and pool surface. Although they are different swimming pool issues, the cause and treatment for them are pretty similar. 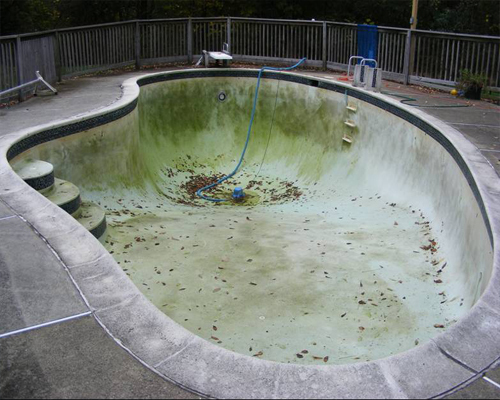 Scaling occurs when calcium deposits are left on pool surfaces after water has evaporated. Scale usually starts to appear on your pool tile first, a white film on the tile making the tile appear faded. This develops a line of white or grey “scale” around the edge of your pool that can be difficult to remove. Scaling can also be seen when calcium deposits come out of suspension and can be seen floating in the pool. Scale on the pool surface can trap stains underneath, and generally results in a wide area of discoloration that will look like a grey rough area on light plastered pools. There are two types of scaling that pool owners have to battle. First one is Calcium Carbonate and the second is Calcium Silicate. This type is white, flaky, and relatively easily removed by using a pumice stone, stain eraser, acid washing, or scale and stain remover. These products will be discussed below. To find out what type of scale you are dealing with, apply a small amount of muriatic acid on the scale. If it bubbles or foams at contact, then you are dealing with calcium carbonate. This type is grayish-white, and is a lot harder to remove because this scale has been there for much longer. To find out what type of scale you are dealing with, use the same action as above. The difference here will be how the scale reacts to the acid. If there is little to no reaction to muriatic acid, then it is Calcium Silicate. The bad news is the only way to effectively remove this type of scale is with a pumice stone and some elbow grease. Or to save time and headaches, call a professional to help you. A pumice stone is a coarse stone that can be used on ceramic tile or concrete surfaces to rub off both kinds of scale. It works very well, but wears down quickly. If you use a pumice stone, make sure to keep the stone and the surface you are cleaning wet at all times to prevent scratching. Staining can be several colors and is caused by a chemical imbalance that reacts with the pool surface. There are two major types of stains that regularly occur in swimming pools. One is Organic and the other is Metallic. Organic stains are from the elements like leaves, algae, or dirt that have been left in the pool for a long period of time. This can generally be cleaned by putting chlorine shock over the stain, then brushed with a stainless steel bristled brush. However, many organic stains, such as those caused by some types of algae, require more complex treatments including enzyme-based pool chemicals and/or metal-based algaecides. Metallic stains are more difficult to remove. Stone water features, decking materials, plaster pool surfaces, pool chemicals, pool equipment, and lawn fertilizers are all potential sources of metal contamination. But most commonly metallic stains appear shortly after the PH is raised or when you add chlorine. Iron is pretty common in well water but rare in city water. Copper is in some algaecides, many "mineral" systems, and ionizers. If the PH in the pool goes below 7.0 for too long, copper can get into the water from a copper heat exchange coil, like the ones found in pool heaters. A stain eraser is twofold, not only works on stains but also on calcium carbonate as well. It can be attached to a tele-pole for convenient use too. There are multiple stain erasers available that will work on different surfaces. This remover, which is safe for all surfaces, is added to the water slowly and wears away the stains and prevents calcium carbonate from coming out of suspension in your water. However, once the calcium is out of suspension, the only way to actually remove it is to allow your filter to take it out of the water. It is important to keep the pH of the pool water at or below 7.6, as higher pH levels are scale-forming. The calcium hardness level should be kept below 500 parts per million to control as well. Pools with a calcium hardness level of 500 ppm or higher should always be treated routinely with Stain Stop to prevent scale formation. The pH of salt pool water is constantly on the rise. Salt pool owners should always to routinely clean to ward off scale formation, as well as prevent scale from forming on the cell unit. There are a few things to do in order to avoid having to acid wash or tile clean your pool. The best approach is to prevent scale and stains before they occur by regular water analysis, routine cleaning and brushing, correct water balance, and the regular use of preventative scale and stain chemicals. You can see that that prevention is really the best policy when it comes to scale! If your fighting a losing battle against the scaling and stains in your pool, feel free to give us a call or visit our Pool Supply Warehouse store to speak with an expert. Well, July is almost here. If you are living in Phoenix you know what that means. Monsoon season has officially started. 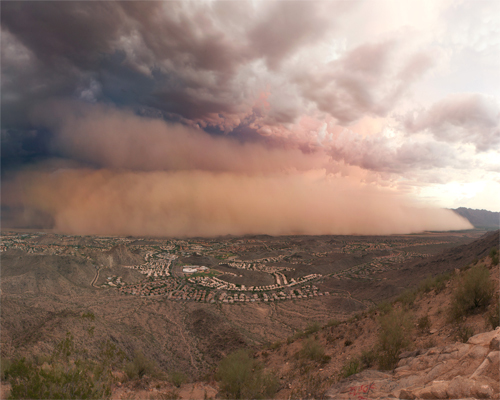 Typically, Arizona monsoon storms start with heavy winds sometimes resulting in a visible wall of dust hundreds of feet high moving across the Valley. These dust storms often leading to heavy downpours. Every summer, thousands of pool owners in the Phoenix area experience some sort of problem with their pool such as clogged filters or water overflow after a monsoon storm. So as a pool owner you have to ask, what do I need to keep my pool ready for the upcoming storms? High winds and heavy rain has the ability to pick up anything from dust and mold spores to tree limbs and patio furniture. Everything that comes in contact with your pool will either stick to the water’s surface or sink to the bottom. In fact, most swimming pools stores will have deals on pool supplies and chemicals to help supply the numerous consumers that will be affected. You can be prepared by keeping your pool supply stocked and educating yourself on what needs to be done when monsoon season begins. No matter what measures you take, there is no way to keep all debris out of your pool. But there are many things that a pool owner can do to protect their pool and equipment from damages and potential bacteria and algae growth that can result from these storms. Even if the forecast is calling for heavy rain, do not think that draining the pool will prevent overflowing and the water from becoming contaminated. This can actually do much more harm than good. Draining your pool not only leaves the pool walls and floor unprotected, likely to become scratched or damaged by any debris. But there also is a chance that it can cause the pool to pop out of its hole. The water table below the surface rises during storms and flash floods, so without the water weighing your pool down, it could pop up and sort of float on the rising water table. Cleaning up dirty water after the storm is easier than draining it. Putting your winter or safety cover on your pool in preparation for a storm can cause more damage to the equipment. There is not much to do to protect against dust and contaminants, because usually the storms high winds and heavy rain cause the cover to lift up and off your pool. Plus with the cover on your pool, it leaves it open to sharp branches and other debris that could fall onto it. Keep your cover put away to prevent damage so you don’t have to deal with a big mess if its full of water and debris. Phoenix monsoons can bring some high winds that can turn any object not bolted down near your pool into a missile that can cause serious damage to your deck, pool, or even your house. If enough time before the storm hits, remove as many toys, accessories, patio furniture and grilling equipment as you can, and store them in a shed or basement. Most of the damage from storms is due to the flying debris, so clear out what could easily be stored. Also, do not put any objects into the pool thinking it will be safe there, this can damage the item plus lead to possible staining issues for your pool water. Again, if there is enough time before the approaching storm hits, trimming any low or over hanging branches and limbs from nearby trees can be the best method for protecting your pool, yard and your house. Tall and overgrown tree branches can easily be torn off, and carried right into your pool during storms. Trimming and removing the branches from your pool area should always be done if you have enough time, as this will considerably reduce the chance of damage. During a storm it is inevitable that dirt, debris, and other contaminants will end up in your pool. Most likely you will need to shock your pool after any type storm, so perform a quick pool water analysis to see what is needed. Stabilizing and adding algae controller to your water beforehand will definitely save you a lot of time after everything has died down. By balancing your pools water chemistry and adding a large amount of an algae controller, most of the bacteria and contaminants that were blown into your pool will be eliminated. Anything left over in your pool should be taken care of by shocking your pool after the storm. If there is even a slight chance that your equipment, like your pump, filter, or motor might be exposed to large amounts of rain or flash flood water, it is imperative that you protect it by shutting the power off. This includes turning off circuit breakers too. This can encompass your pump, motor, filter, heater, chlorinator, and lighting fixtures. This can assist in preventing any potential electrical problems that could result from the excessive water. Now even if you shut off the power to all your pool equipment, there is still a chance for it to be damaged by the wind and debris that accompanies monsoons. To help escape any damage, it is recommended to cover your equipment with a large plastic tarp or other types of waterproof covers. Don't forget to tie down the cover as tightly as possible. If you have any questions about preparing your pool for a storm, feel free to give us a call or visit our Pool Supply Warehouse store to speak with an expert. Let’s take a look at how to make your new swimming pool the talk of the neighborhood, and add more fun. Have you ever thought about a slide for your swimming pool? If you haven’t, I am sure your children have. So let’s take a look if a swimming pool slide is right for you and your family. The majority of swimming pool slides are made of fiberglass or acrylic with a top coating to keep the slide nice and slick. Your standard slide has a metal ladder and needs to be bolted or secured to the ground in some way. 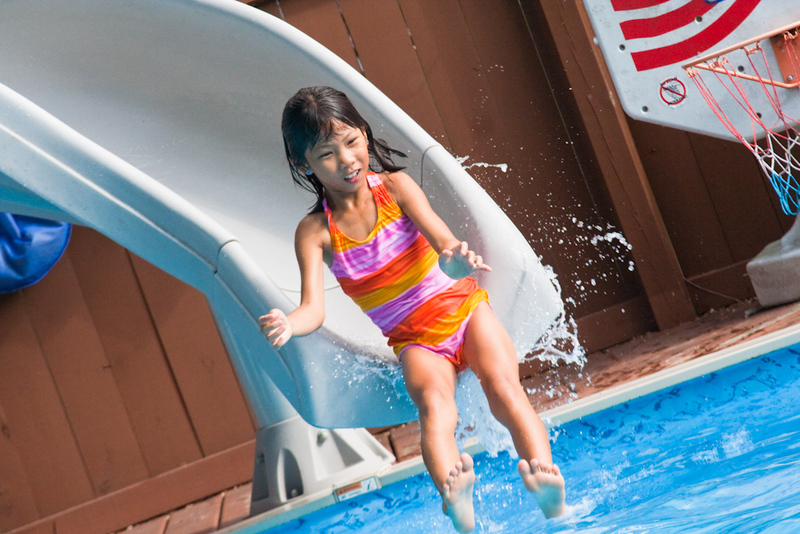 You also need to keep water flowing down the slide to minimize friction when flying down into the pool. The most common slides are added after the pool is built. You can also go with a custom approach to the swimming pool slide. This is built into the pool, normally at the same time as the pool is being constructed. The slide can be covered in almost any finish, normally a faux rock, to blend into any surroundings features. During this process plumbing is added, so running your hose to the top of the slide is not needed. Now the pros of a pool slide are pretty straight forward. They add a unique and different element to your swimming pool. Let's face it, children and even adults love the pool slides. If not, then why do water parks exist. Second, it can add an aesthetic aspect to your backyard giving your pool some character. By building the slide into the pool, it will act like a water feature adding even more flare to your pool. A slide into your swimming pool can be a great addition to any swimming pool. The first thing that comes to mind is price. A slide can add thousands to the cost of your pool, depending how elaborate you want it. With additional rock work, plumbing, and labor hours the price can add up quickly. There also is always the safety element of a pool slide. Depending on how your kids, and some adults, use the slide, it can cause some minor injuries. Another potential con could be HOA. Many times the slide can go above your property fence line and require approval from your HOA. So you can see there are cons to the swimming pool slide too. A pool slide can be a great way to get the most out of your new swimming pool or add new life to an existing one. It is completely up to you and your family on the potential need for a slide. So take a look and see if you could benefit from a great water feature. Learn more about how to keep your swimming pool fully maintained this summer by signing up for our email list. Is Your Pool Party Ready? One of the greatest advantages of having a swimming pool is the friend and family gatherings and epic pool parties. It's all about BBQ on the grill, pool games and making memories that no one will forget. The one thing that is sometimes overlooked is what pool supplies and maintenance is needed to prepare for such an event. But planning for your party should not include stressing about how your pool will look on the big day. We put together 6 east steps to put your mind at ease when preparing your pool. By following these pre-pool party prep steps, you'll be ready with clear, sparkling blue water for everyone to envy. Brush your pool three days before your party. This will remove any dirt or debris that may have formed on the sides and bottom of your pool. Be sure to brush while the pump is operating and to sweep slowly. Wax on, wax off. Start from the surface and work your way towards the main drain so the dirt is sucked up by the cleaner. Be sure to shock your pool after you brush. Pool parties can cause an increased level of debris and more swimmer waste than usual. By adding the shock ahead of time, you are preparing your waters chemical levels to handle the strain of an onslaught of swimmers, divers and cannonballs. Check your filter pressure two days before your party. 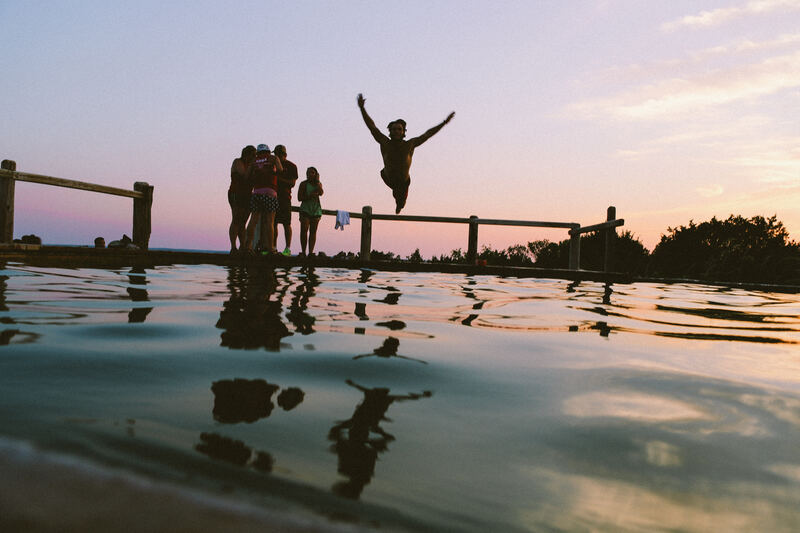 Your filter is the first line of defense against the countless shenanigans that a pool party will dish out. You will want to backwash and clean your filter as well, if needed. Be sure to add water clarifier and algae eliminator as well. This will ensure when guests enter your backyard, they will be greeted by crystal clear water. Using a water clarifier allows easier filtration of dirt and debris and removes anything that will create a cloud in the water. The algae eliminator will prevent any algae spores from forming before the party starts. Perform a pool water analysis and vacuum on the day before party. 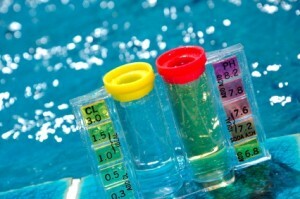 Test your pool water for chlorine and PH levels to make sure it is balanced. Add additional chemicals if needed. Then vacuum your pool and clean out the skimmer baskets. Give your pool one last check on morning of party. Skim any debris that may have dropped in overnight and a quick check of the baskets. If you have any pool rules, post signs around the pool for everyone to see. That’s it, you are good to go. Let the party commence and the fun begin. Using these easy steps before every party will ensure jealousy from your neighbors and a relaxing time by the water. So sit back and let the good times roll! Do you use or have any additional tips or tricks that help get your pool party ready? Feel free to share them in the comments below! We have all seen those pools on the news. 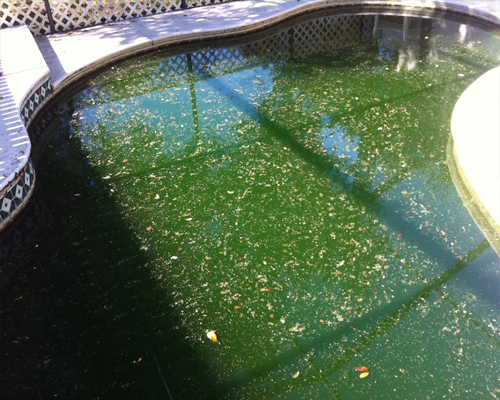 The green, mosquito infested swimming pool that neighbors have been complaining about. Checking your swimming pool chemical levels is an easy way to keep that from happening. Here At Pool Supply Warehouse we will test your water to ensure that your swimming pool stays healthy and clean. Calcium Hardness: 180 - 220 ppm, though some say 200 - 400. So bring us a water sample and we will make sure that you are on the right track.